We were looking for a poodle puppy. 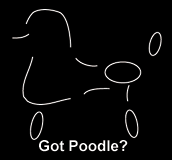 I came across Mithril Poodles and loved the philosophy! There were two pups left and something about Orange Collar girl made us need to have her! Almost a year later, Ms. Lily is a beautiful red poodle. Shes on the small side with lots of energy, great intelligence, and a wonderful temperment. If youre gonna get a poodle, I recommend Mithril! I met Carolyn through an ad back in 2008. I was searching for a "different" breed to show. She was gracious and so willing to help me learn about the breed, and she is a wealth of information! I bought a blue boy from her, he was not my original pick but when she called to tell me the pups were ready to go to their new homes, she advised me that I should look at two others that I had not originally considered. When I got to her home, she showed me all the beautiful babies, but picked out two she thought would be better show quality dogs, a male and a female. I immediately saw what she meant, they stacked themselves. If I could have, I would have taken them both, but I took the boy. He changed my world. Besides being the love of my life, he is healthy and great tempered. He's also smarter than I am so he gets basically whatever he wants. I unfortunately was not able to show him for personal reasons, but that didn't keep me from keeping him in top condition, and I get asked about him all the time. If you are considering this breed, think no more, if you would like an ethical breeder, search no farther. Carol does her homework and I can assure you, health is at the top of her to-do list. My boy's grandsire is Keanu, the white male on the left and his sire is Argos, I believe that's him on the right. Her reds are rich and gorgeous! Thank you Carol, for your love and dedication to the fantastic breed. This Is truly a 30 Star Review!!!! I first found Col. Carolyn through her friend & Show trainer Paula Ford so a some of these Stars need to Share w each other. You see Col. Carolyn was on assignment during this time! 11-18-12, mom (89) & I decided to Breed our White Duchess Georgette (Grand daughter of Ch.Shipp's Anani Kneau ! Col. Carolyn's earlier Champion). With Paula's help we decided to Breed for Silver pups. On today 1-19-13, 3 yrs ago our litter was born. We Bred to a young Stud Rocket. He was Beautiful still in color change. The litter was only 6 very healthy pups, 4 boys &2 girls. Well, I could not have been happier! Carolyn who was out of States & in a Very Dangerous area, would always reply to my emails full of Questions! # 1 how do I know what Color my pups will be. All born Black! During this time my mom's health changed. These Pups bought her Great joy! I must Brag on the People who bought my 4 boys! One a Vet who named him "Nyx,"Another has a Ranch & is Great trainer his is Named "Maxx" & then a Cute Family from Texarakana Tx, who bought the Biggest Boy I called "Bear" ! I wish I could add their Pic's! All these pups have thrilled their owners with how Smart & Trainable they have been. In one Email from Carolyn told me, she bred more for Brains 1st & then Show. She bragged some of her pups were Service dogs. That I do fully believe. I kept my 2 girls" Coco & Chanel", yep for my favorite French perfume! I purchased my first Standard Poodle from Carolyn back in June of 2011. I have always had dogs, but since I had located to Texas I would need a dog that would be friendly enough to family and friends coming to visit. I found Carolyn's site as I was looking for a red standard poodle, but at time she didn't have a current litter, but she did have a 7 month old silver poodle who I really wasn't interested in. She told me that he was house trained, good looking and that he was really nice, I told her to send me some pictures and I would think about it, but I really wanted a red. Sent her a message the next morning and told her I could pick him up this weekend. So you see not only does she have wonderful dogs, but knows how to match up, which dog is best for you. Fallen is the best dog I have ever had and still turns heads were every we go. Fallen has a new brother a black standard poodle that I picked up in December of 2015 and in February 2016, I picked up another silver poodle puppy for my granddaughter. You will be very pleased with Carolyn's poodles. Mithril Zelda Grace is 6 years old! Thank you Carolyn. With Zelda I have had 6 years of the very best Standard Poodle love and devotion. She goes to work with me and has her own fan club. Calm, dignified,but with a very protective bark. She travels long distances with me by car and we have never had car sickness . She is always ready to go to work! If you want a strong, healthy dignified Standard Poodle go to Mithril. Over the years I have known 3 of Carolyn's Standards. All have been exceptional companion dogs. You won't go wrong with a puppy from Carolyn. She has exceptional lines and produces pups with some of the best temperaments & health I have ever seen. Carolyn produces dogs that are the whole package. She is a down to earth individual who knows what she is doing and has been doing it for many years. Give her a call or send her an email if you are looking for your next best friend. I am very pleased with my Mithril standard poodles! My silver boy Mithril's Patience of Jobe is a UKC Champion and has a James Bond cool personality,. My red boy Mithril Champagne Sunshine Boy has not only repeatedly woken me in time to take my meds and prevent asthma attacks, but he has also produced an amazing litter of pups with beautiful deep red colors, vibrant apricots and beautiful temperaments.. And my girl Mithril Champagne Sugar Baby excels at obedience, comedy and a Rich Little level of impersonation of the Star Wars Wookie character. Carolyn's mentoring is immeasurable and her honesty refreshing! I recieved my first Mithril standard poodle as a Christmas present in 1999 from my Mom. Carolyn guaranteed her puppy and that she would take him back if anything was wrong. Needless to say nothing was wrong with Fog who became a gorgeous silver standard and the best dog I have ever had the pleasure of living with. A couple years later, Fog needed a new friend and I went back to Carolyn and picked out Snow, the palest of cream. Fog & Snow lived happy healthy lives, but alas are over the rainbow bridge. I was again looking for Standard Poodles and I contacted Carolyn again and was very happy to find out that she still is breeding wonderful dogs. I really wasn't looking for a puppy and wanted an older dog. She had a wonderful retired show dog, Mikki, whom I adopted. While there I did, also, pick out a new black puppy. I now have 3 wonderful standard poodles, one rescue and two Mithral dogs. I can't say enough about how healthy and wonderful these dogs are.